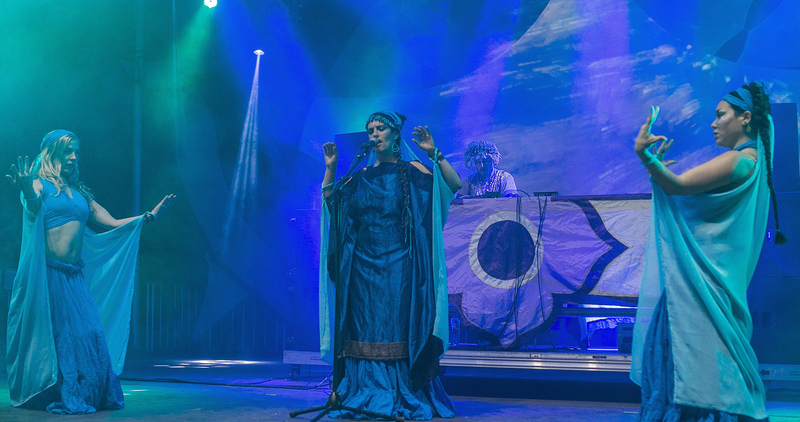 this production was intentionally created to give an audio and visual narrative to the second chapter of his concept album series: Story Book of Earth. Open Ancient Eyes being the first chapter in the trilogy , the second in the series was tailored to fans this year as a sneak peek into the upcoming album. 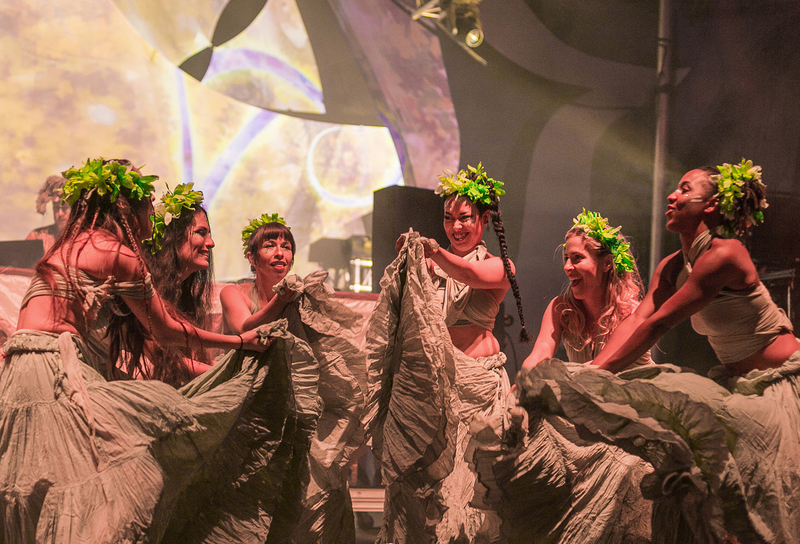 A celebration of the earth through color, distinctly different dance & theatre performance genres in every scene, with tailored projected visuals to narrate creation stories of our ancestors. 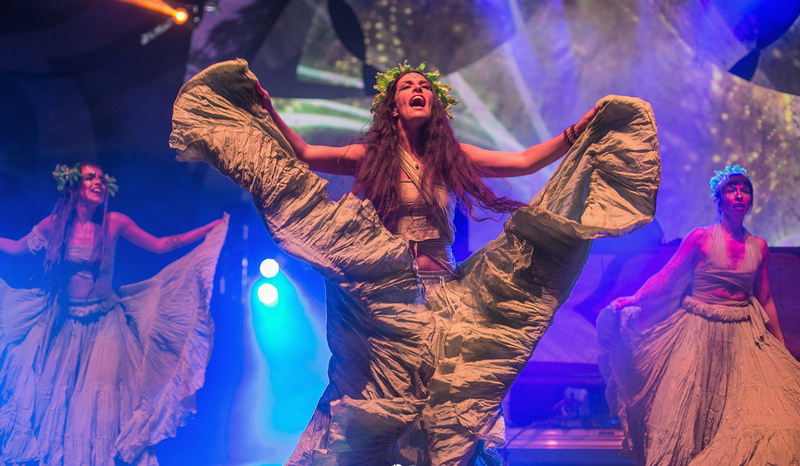 Creation stories from around the planet infused into a 90min soul nourishing spectacle inviting audiences to join in on a journey into the elements as means to connect with our bodies as the living earth within us , as us, all around us. It’s been five years since Evokation Sacred Art has produced a full cast production with Eve Olution back in the director seat and each woman on initiatory journey inside the container of Ritual Theatre. These types of alchemical productions originally began in Southern California from 2009-2012 under the former name Soulvoice Sacred Art. These productions served as beacons of inspiration and personal transformation for much of the local San Diego and Los Angeles tribal art communities. Both performers and audiences were greatly impacted by the profundity of the palpable energetics experienced in these creations. Each performer was guided to embark on a personal voyage within the context of dedicating weeks and months of their lives to learning ancient mythology and then incorporating the archetypal blueprints within the mythos into their daily lives in order to fully experience the ancient power of bringing awareness to the life altering art form of evocation. The initiation of every performer is the absolute key to each intentional production of Evokation. It is this journey that becomes the heart of magic inside the curation of these detailed productions. The personal devotion of everyone involved truly makes these offerings extremely special and cathartic for both audience and performer. The journey for each of these artists begin with entering a global cyber audition that is announced on fall equinox every year. Several incredible artists are then selected to immerse in a seven day intensive where they explore techniques, modalities, and practices that are the base platform from which they will then decide to commit to for the next several months. Every week they are guided into exploring specific techniques along with their own personal practice of sitting and movement meditation throughout each week. Basing these practices inside the container of mythology and ritual amplifies the experience for the group and it doesn’t take long for them to begin processing unconscious material that gets stirred up from this type of archetypal transpersonal work. The sole responsibility of keeping the group held, focused, and synergized is the producer and director Eve Olution. With her background in theatre for the past few decades in culmination with study and practice in energy medicine for the past decade, Eve has crafted an ability to guide these individuals personally and monitor the group in an organic cohesion for the final product that the audience experiences on a multi energetic level. 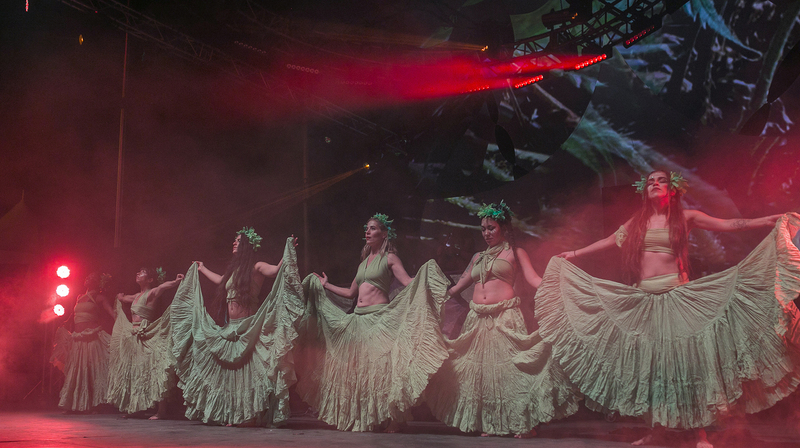 This collaborative troupe offers their personal and artistic journey in a raw, authentic yet artistically masterful way and in that offering the entire experience becomes more than just a performance. This particular production and music album is dedicated to the Gaian Mother of all human beings on this planet. 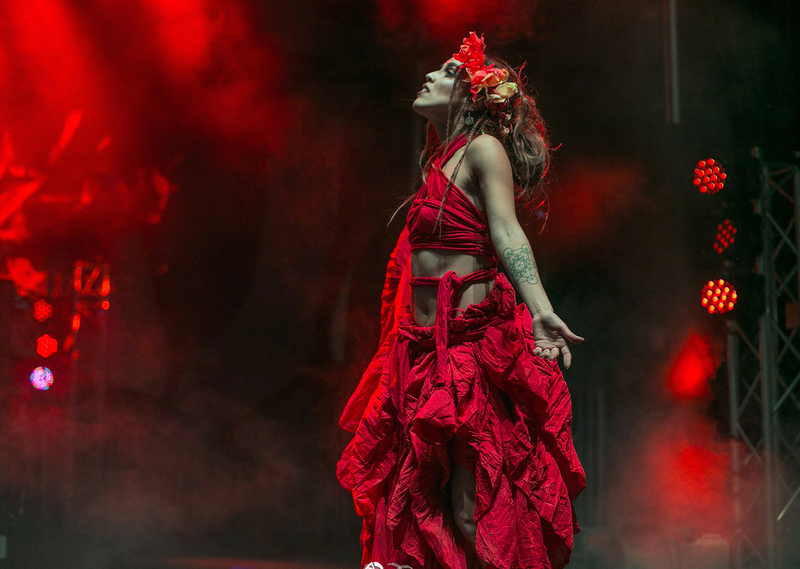 It is a living prayer woven into the music from which all of the artisans placed a nine month journey on the altar of their lives in daily commitment to invoking the elements and the Gaian mother spirit herself to dance through and take root. In this kind of intentional cauldron, many of the women in the process radically shifted in incorporating tools of healing, powerful insights, and a having a tangible means of connecting to aspects of themselves which had laid dormant until now. Practicing, learning, and dedicating to every nuance of the experience with an intention of making art, then adding another layer that the art be an offering of healing of the planet & all her children, allowed for instant awakening to the simplicity of the power in ritual of the heart. Ritual dedicated to something beyond the self which catalyzes an ability to open to the inherent empowerment of listening deeply to the body in relation to the earth mother. Many of the women experienced the past several months as completely life altering and opened a potential doorway to exploring this type of art as a lifestyle pathway and dedicated mission of the soul. Imagine, performance artists transcending beyond entertainment and stepping rightfully into the roots of where Theatre began. The greeks word for god Theos. Theos (god) – arte (art) , Theatre: the Art of god. A mere mortal’s means to connect with the intelligence of all creation and creation itself. Are we not then, transcending modern experience of art forms back into their original meaning and service to humanity? Transcendence through evoking connection, embodied intention, & devotion to the heart; these are the codes written inside this offering of music and mythos as One. And ALL our fans who cheer us on and fully receive everything we pour our hearts into of every performance! HD Video of Last Year’s production in Boulder Theatre : OPEN ANCIENT EYES click on highlighted words to view.